How to tell something and show it at the same time? In terms of rhetorics 'evidentia' is the answer to this question - the figure of speech that virtually brings to live, seems to make visible what is said. For a long time mathematical demonstration has been viewed as the essence of evidentia, until modern science and scholarship produced new figurations of evidence: autopsies in the theatre of anatomy, spectacular experiments and the demonstration of technical instruments, the performance of speculation in free speech or the lantern lecture of the art-historian. The scenario of the public lecture became a laboratory for the production of evidence. But to combine showing and telling in a way that makes evidence happen is neither pedagogy nor pure scientific method. It is a form of art: the art of demonstration. A form of art that usually is hidden within the presentation of knowledge itself. Showing and telling, showing and hiding - how do they go together? Is it possible to demonstrate the art of demonstration? Perhaps with the support of a magician? Kindly supported by Kulturbehörde der Freien und Hansestadt Hamburg. Sibylle Peters studied literature, theatre and philosophy in Hamburg/Germany. MA with a thesis on the production of meaning in postdramatic theatre; PhD with a thesis on tactical media and time. She works as researcher and lecturer at the universities of Hamburg, Munich, Bale and today at the Institut für Theaterwissenschaft, Freie Universität Berlin. Topics of publication and exploration: the academic lecture as performance, time and media, theatricality and knowledge, rhetorics and audiences, economies of the public, performative evidence Sibylle Peters works as director and performer for several lecture-performances (i.e. 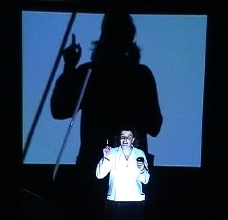 "Lever de Rideau - die Szene des Vorhangs", gemeinsam mit G. Brandstetter, Schauspielhaus Hamburg 2004), as well as conceptual and political performances (i.e. "Asche zu Asche. Eine Show zu Theorie und Praxis des Geldverbrennens", next presentation: Die Wunder von Bochum, Ruhrtriennale 2005) and performative projects for children in the FUNDUS-Theater Hamburg (i.e. 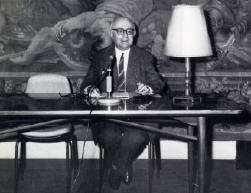 "Schuluhr und Zeitmaschine. Eine Science Fiktion in Echtzeit", invited to Kinder- und Jugendtheatertreffen Berlin 2005). Matthias Anton: conceptual artist, magician, expert on chinese script and culture.